If white carrot cake is something, then black carrot cake should be the same thing in black, right? Wrong. OK, after some hectic shopping at the Pagoda street in Chinatown, Singapore, which you shouldn't miss on your trip to Singapore, I was looking for Telok Aiyer hawker centre. 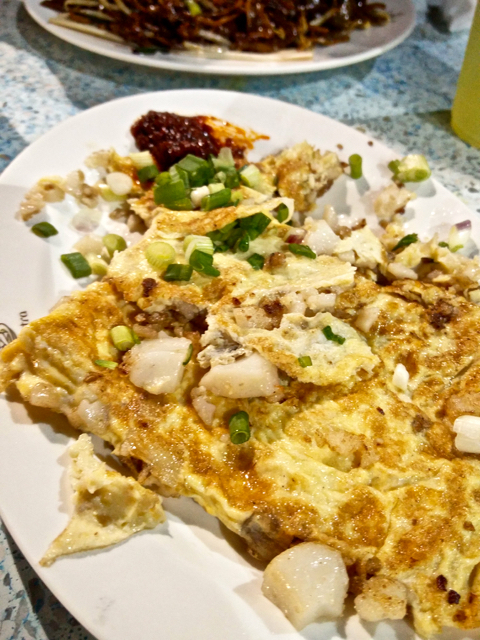 Operating 24/7, under a HUGE space, it was supposed to be the go-to place for hawker foods in Singapore, but with two hungry kids and after struggling to find it, we found ourselves at the Chinatown food street, barely a stone's throw away from Pagoda street. It is covered street, so the sun is not going to roast you and though it seems like some the chairs outside the restaurants belong to them, they don't. You could sit wherever you want on the road side chairs. There are two types of restaurant on this street, one along the two sides of the roads with a proper dine in space (with chairs and tables outside that don't belong to them) and a row of kitchens right in the middle of the road. Avoid the 'proper looking' ones. I got one fried rice and it was overpriced and barely palatable. Besides that glitch, the rest of the meal was great. So, back to the black carrot cake. After a wonderful white carrot cake at another hawker centre, this was the time to try the black version. After paying $4 and picking up my order, the complete difference struck me first. It wasn't a black version of the white carrot cake, but completely different. Unlike the white version, which was like an omelette, the black version was like french fries. 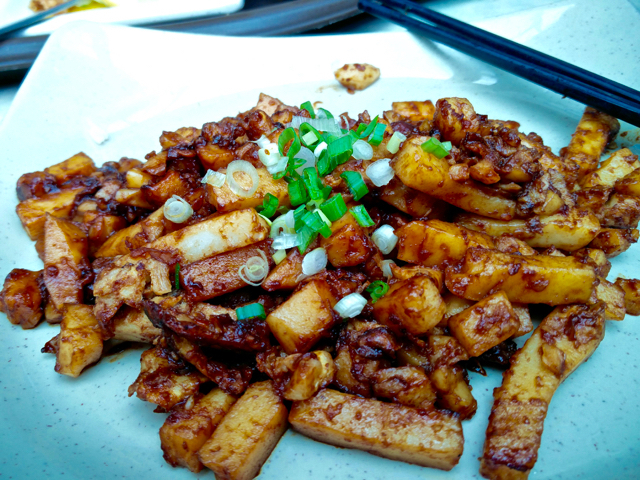 If you recall, carrot cake is neither carrot nor cake, but a radish (known as white carrot in some places) dish. It was finger sized radish stir fried with a soy based sauce. With extremely familiar flavours of soy and that soggy french fries consistency of home made fries, I loved the dish. The lemon chicken with bok choy was the other dish from the hawkers. 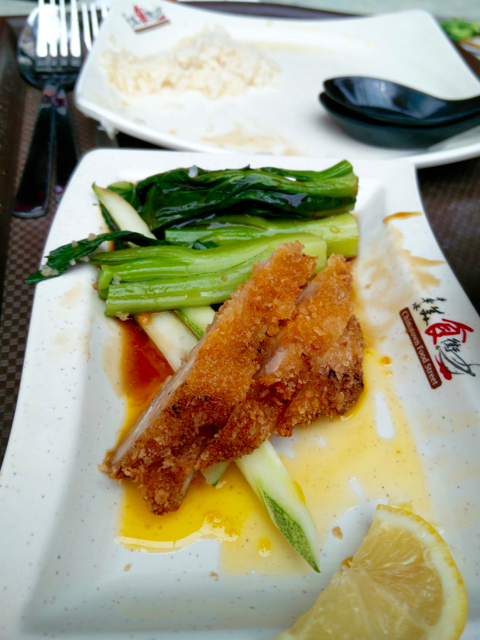 Beautifully crusty chicken with a whiff of lemon in a slightly tangy sauce base with lovely bok choy, made the hawker lunch just what we were looking for. The kids seemed happy with the bland fried rice and some Hershey's milk shake, so they were fine. Our dessert was the Ice Kachang. 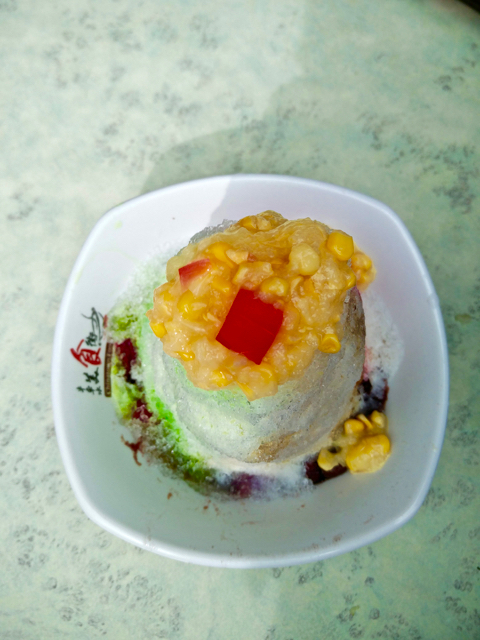 Shaved ice over multiple layers of corn, basil seeds, syrups of various colours and flavours and some fruit, Ice kachang is like a bonding dessert that takes forever to finish, but one that gives you various flavours in a single dessert. At $4 for the carrot cake, $9 for the lemon crusted chicken and $4 for the ice kachang, the $11 fried rice stood out like a sore thumb, but the rest of the meal more than made up for it. 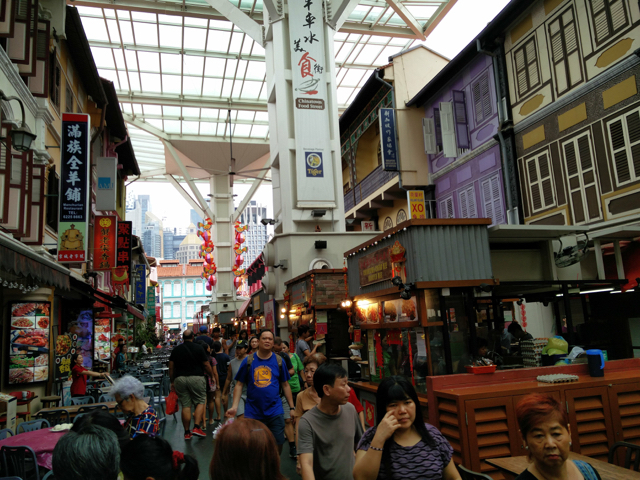 Chinatown Food street is two streets away from the super popular Pagoda street for shopping, but if you can, try to give the Telok Aiyer hawker centre a shot first as it is much much bigger and I hear is definitely better, though if time permits, Chinatown Food street also ranks very high on the lists of a lot of Singaporeans.